Prepare to be impressed: The Canon EF 16-35mm f/2.8L III USM Lens delivers outstanding image quality, far surpassing its predecessor, in a very well built, great-to-use lens that features a range of focal lengths that I consider a critical part of most full frame (and many APS-C format) kits. The price tag is going to be a barrier for some, but serious photographers are going to find the image quality this lens delivers to be totally worth the cost. 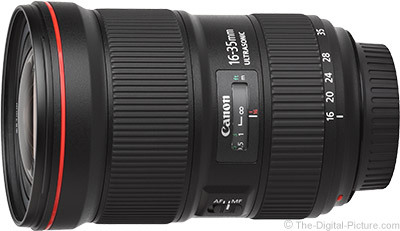 As made obvious in the name, the Canon EF 16-35mm f/2.8L III USM Lens is the third version of this lens model. Many of us were excited when the Canon EF 16-35mm f/2.8L II USM Lens showed up in 2007, replacing an only-7-year-old lens with a better performing one. However, the f/2.8L II lost a lot of luster when the Canon EF 16-35mm f/4L IS USM Lens arrived 7 years after that. The f/4L IS showed us what Canon could do with a wide angle lens, particularly in terms of full frame corner image sharpness. Not all of us need the f/2.8 max aperture, image stabilization increased the lens' versatility significantly and many of us quickly adopted and continue to heavily use the f/4L IS. With a lens as great as the only-2-year-older f/4L IS in its lineup, the 16-35 f/2.8L III arrived, lacking IS and costing considerably more. However, one thing that the f/4L IS does not have is that f/2.8 aperture. Image stabilization does not stop subject motion and an f/4 aperture cannot create the same background blur that an f/2.8 aperture can. And, there are many times when these features are very important. Before the image quality delivered by the 16-35 f/2.8L III was known, we knew that Canon could produce very sharp ultra-wide angle lenses. I mentioned the 16-35 f/4L IS and the Canon EF 11-24mm f/4L USM Lens is another incredible, recently-prior-introduced lens. I speculated that if the 16-35 f/2.8 L III was a repeat performance, it would quickly become very popular itself. The good news is that the 16-35 f/2.8 L III sets a new benchmark in ultra-wide angle lens image quality, surpassing even the 16-35 f/4L IS and the 11-24 f/4L lenses at their widest apertures. As expected for a member of Canon's L-Series, the 16-35 f/2.8 L III is built for professional use and this lens will bring home critical imagery from the world's biggest events. As I said in the 16-35 f/4L IS review, a just-over-2x focal length range is not going to get much attention from the marketing department. This is not a superzoom lens, but this range is average compared to other full frame lenses sharing these ultra-wide angles of view. And, most importantly, the focal lengths contained here are extremely useful. Although a general purpose lens may get more use, a 16-35mm lens will often be the number 2 or 3 most-used lens in a kit. In general, the wider the angle of view being used, the more challenging it is to compose a great image. A telephoto lens makes composing an image relatively easy as narrow angles of view include less background and that background can be more easily blurred into obscurity. A wide angle of view, especially 16mm in this lens, takes in a big scene and allows unique perspectives with more background showing – and that background is less-easily blurred away. This means that more careful attention must be paid to the composition. The award of a well-composed ultra-wide angle image is worth all of the effort required to get it. I love wide angle lenses. I love the wide angle challenge and I especially love the wide angle results. Let's take a look at the focal length range (FLR) that this lens provides. 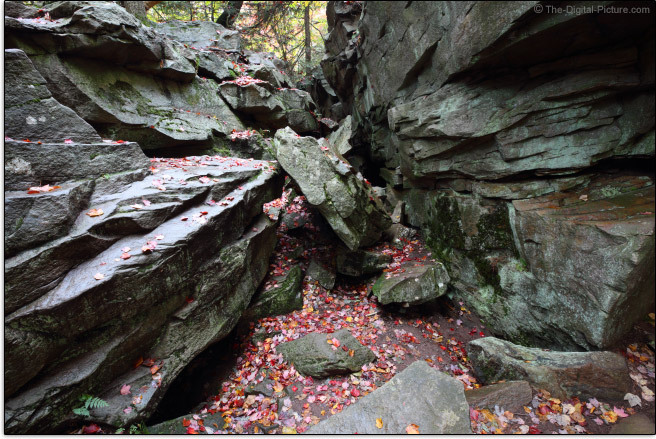 For this series, we go to a great pile of massive rocks at Midway Crevasse in Ricketts Glen State Park. Now we'll mix things up a bit to illustrate perspective (these samples were borrowed from the 16-35 f/2.8L II review). The first row of mouseover links above will show you the full frame 16-35mm angle of view from a stationary position (similar to the focal length range example above). 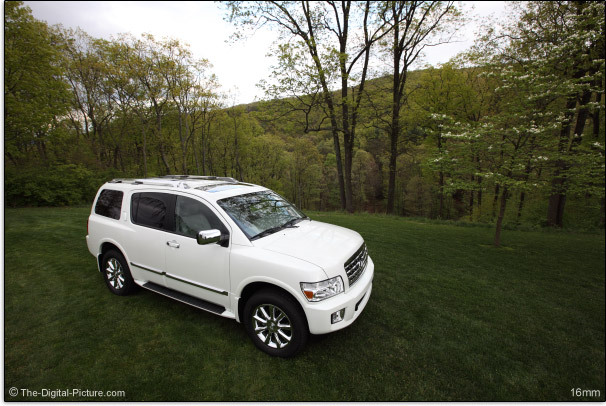 The links in the second row show perspective change – the subject distance is changed to retain similar framing of the vehicle at each focal length. While not ultra-precise, these examples show how relative distance to objects affects the appearance of those objects. For example, at 16mm, the tail light appears huge relative to the rest of the vehicle due to its relatively close distance to the camera. Since wide angle lenses emphasize the closest in-focus objects in the frame, making a compelling ultra-wide angle image often involves placing an attractive subject in the foreground. Since an ultra-wide angle of view includes lots of background that tends to remain at least partially in focus and recognizable, that attractive foreground subject will ideally be in front of a large, attractive background. A beautiful bunch of flowers in front of a large mountain range (with a lake between them) is a good example of this concept. What you do not (usually) want in the foreground of your ultra-wide composition is a person's nose. We don't typically look at people from really close distances (that other person will become uncomfortable with us being in their personal space) and when we look at photos of people captured from these distances, certain body parts (often the nose) start to look funny. Unique portrait perspectives can be fun, but this technique should not be overused as it gets old quickly – and your subjects may not like it. Get the telephoto lens out for your tightly-framed portraits. Or move back and include your human subject in a larger scene for an environmental portrait. The only moderately-wide 35mm focal length is a great choice for full-body portraits. This focal length range also handles small up to very large groups nicely. 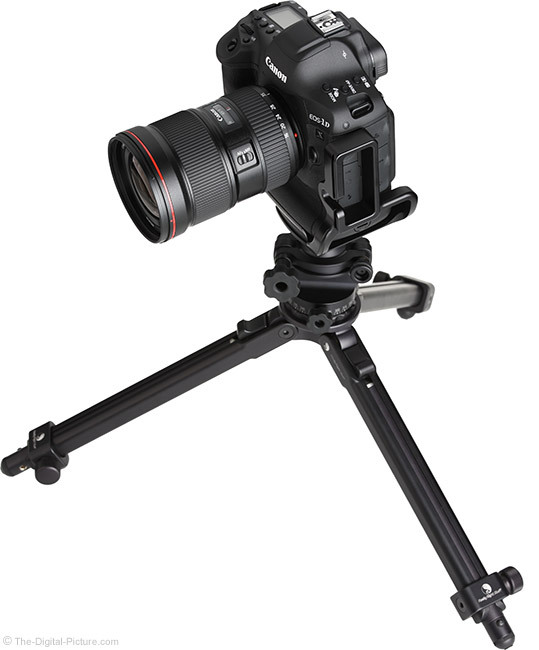 The 16-35mm focal length range (FLR) is a great option for the wide work at a wedding, at events and for other photojournalism needs, especially with the f/2.8 aperture available to stop subject motion in low light and to aid in blurring the background. For similar reasons, many sports photographers carry a wide aperture wide angle zoom with them. While this focal length range is not usually ideal for tightly framed images of participants, it is great for environmental sports images and for capturing the venue such as a sports stadium. This lens can also be used overhead, to photograph over crowds such as after a football game. 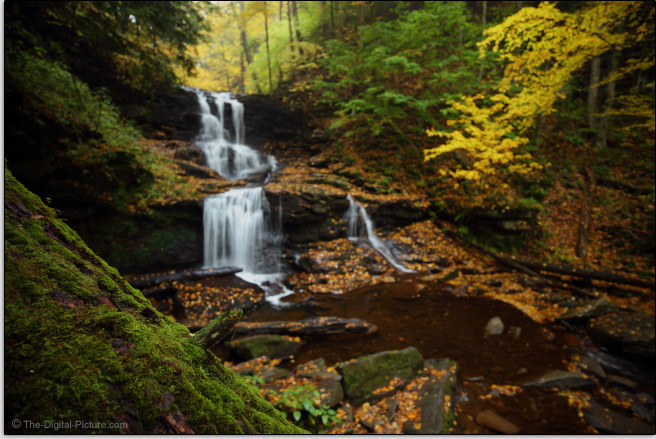 Landscape photography is a great use for this FLR as illustrated in the 16mm example below. This is Hidden Falls and due to very large trees that have fallen into this beautiful little spot, focal lengths narrower than 16mm will be challenged to capture the full scene here. Either the ferns or the falls will be clipped. This range of focal lengths is ideal for photographing the night sky and the wide aperture is highly complementary in this regard (as is the exceptional sharpness). Architecture and real estate photography are great uses for the 16-35mm FLR. Wide angles make interior spaces look large and allow for illustrative composition even when working space is limited. Going underwater? The 16-35mm FLR is a great choice for aquatic adventures, allowing framing of your subject from a close distance, minimizing the image degradation caused by water clarity issues. Use this lens for shooting in a vehicle, inside of a large product ... and far more locations than I can think of right now. If most of your needs dictate wider angles of view, a 16-35mm lens could even make a good primary general purpose lens for you – especially if using a 1.6x/FOVCF body where this lens provides a 25.6-56mm full frame angle of view equivalent. The uses for the APS-C angle of view range push toward more general purposes needs, but encompass much of the above uses as well. The f/2.8 aperture has traditionally been the widest available in a zoom lens. Sigma not long ago stirred things up with their full frame compatible Sigma 24-35mm f/2 DG HSM Art Lens. While a handful of other f/2-and-wider zoom lenses are available for APS-C format cameras, the 24-35 remains the only full frame f/2 or wider option as of review time. That said, I'll call this lens "fast". As already mentioned, a strong advantage this lens holds over the 16-35mm f/4L IS is the one stop wider aperture. One stop means twice as much light. This means that action can be stopped in half as much light using the same ISO setting, or that a 1 stop lower ISO setting can be used in the same lighting. Indoor sports and low light events are two scenarios where this lens' aperture can be game-changing. The f/2.8 aperture delivers a bright viewfinder image and delivers enough light to enable the higher precision center AF point on certain cameras' AF systems. Wide angle lenses are not the most adept at creating strong background blurs, but the f/2.8 aperture is better at this than f/4. Following is a 16mm aperture comparison example. While a significantly-reduced image de-emphasizes the amount of background blur being created, it is obvious that f/2.8 at 16mm is not going to totally blur out the background even with a close subject and distant background. The background remains blurred beyond f/5.6, but you can't tell at this output size. 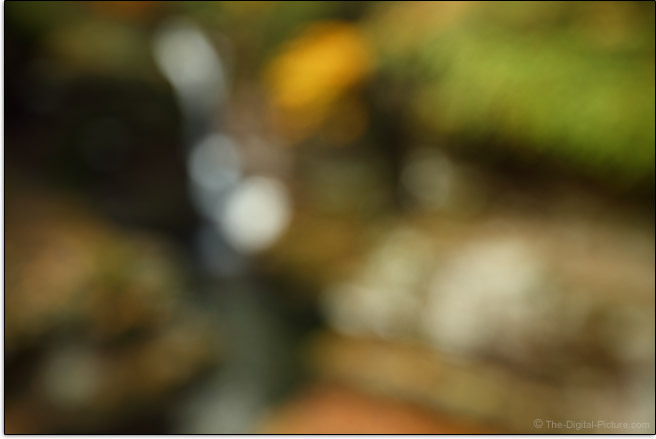 The 35mm end of the focal length range can more effectively create a blurred background as seen in the maximum blur example below (lens set to the minimum focus distance). The similar 16mm example likely reveals what you are looking at. In a zoom lens, the max aperture will sometimes be stated as a range, indicating that the max aperture narrows as the focal length increases. This is not the case with many of Canon's L-series zoom lenses and a very positive feature of this lens is the fixed max aperture. Manually-set wide open exposures can be retained and counted on throughout the entire zoom range. As usual, I was very anxious to see the image quality this lens was capable of. This lens being a member of the Canon L-Series following two years behind a similar model introduced with stellar performance increased my anticipation significantly. Where were the opportunities to upgrade the 16-35 f/2.8L II from an image quality perspective? Image sharpness improvements were at the top of my list. At 16mm, the version II is very sharp in the center of the frame, but relative to the just-referenced 16-35 f/4L IS, the corners are not so good. The II's f/2.8 image quality degrades as the focal length increases with some rebound at 35mm and stopping down improves the II's image quality noticeably. Based on today's standards, I would have been disappointed if the III did not show a big improvement throughout the entire focal length range at f/2.8, especially in the corners. Backing up that expectation was Canon's claim that notable improvements in center to corner image quality had been made. Also backing up that expectation were the manufacturer's theoretical MTF charts. Our first hint to a lens' optical performance often comes from the manufacturer-provided MTF charts and here is an MTF chart comparison featuring four of Canon's ultra-wide angle L lenses. The thick lines show contrast while the thin lines show resolution. The solid lines show sagittal (lines radiating from center to the image circle periphery) results while the dashed lines show meridional (lines perpendicular to the sagittal lines) results. The black lines indicate a wide open aperture while the blue lines show results at f/8. The left side of the chart shows center-of-the-image-circle measurement and the right side shows peripheral measurement. The higher the lines, the better the lens performs. When all of the lines get crushed into the top of the chart, the lens promises to be amazing. Are the Canon EF 16-35mm f/2.8L III lines better than the version II lens' lines? Absolutely and resolutely. We're looking at a significant upgrade here. Are the III's lines better than the f/4L IS lines? I think so, but this difference is not as striking. However, it does not need to be – simply matching the f/4L IS lens' optical performance would have been great. Both the 16-35 III and f/4 IS make the 17-40 results appear ... lacking. The MTF charts predicted excellence in regards to 16-35 L III image quality and the good news is that I think you will find that expectation fully delivered. With a pair of Canon EF 16-35mm f/2.8L III USM Lenses going through formal and informal testing, we have not been left disappointed. This lens is absolutely razor sharp across the entire full frame sensor at 16mm f/2.8, showing very impressive resolution and contrast. Stopping down makes very little 16mm sharpness difference in the center of the plane of sharp focus. As the III's focal length is increased, the periphery of the image circle begins to show a slight reduction in sharpness and by 28mm, that degradation reaches the center of the frame, worsening slightly through 35mm. Image quality at 35mm f/2.8 is not bad at all, but it is not as totally impressive as the 16mm f/2.8 image quality. Stopping down to f/4 results in a razor sharp center of the frame throughout the entire focal length range with the change being most noticeable from 28mm through 35mm. The area of sharpness pushes outward into the image circle at f/4 with the most significant change showing at 35mm. There is negligible sharpness increase realized by stopped down further than f/4 (aside from that due to increasing the depth of field). Comparing apples to apples, the the Canon EF 16-35mm f/2.8L III USM Lens simply blows the version II lens out of the water and remains the clearly better lens even at f/5.6. That was as-expected. Not as certain was how the III would compare with the Canon EF 16-35mm f/4L IS USM Lens, a lens that is renowned for its performance. Simply equaling the image quality of this lens would have been a big deal. Surpassing this lens' sharpness with a 1-stop wider aperture (clearly so at 16mm) was not what I expected. Want to be really impressed? Put the 16-35 L III at 16mm up against a $10,000 prime supertelephoto lens with an ultra-high resolution 50 MP DSLR behind each. These lenses have completely different uses, but the EF 400 f/2.8L IS II is widely recognized as being an incredible performer. Distortion aside, the 16-35 III is comparable and qualifies for notoriety itself. Let's review some real world examples. These images were captured under the scrutiny of a 50 MP Canon EOS 5Ds R using manual focus. RAW format was used and processing was via DPP using the Standard Picture Style with sharpness set to "1" (very low). Images were cropped to 100% resolution (no reduction – pixel level detail shown). The following examples are from the center of the frame. At 16mm, in the center of the plane of sharp focus, showing more than the f/2.8 example was probably a waste of your bandwidth. The light high pass filter sharpening of the f/2.8 image produced a sharper result than stopping down to f/5.6, showing that it was extremely sharp to start with and slightly over-sharpened for my taste. The description of the 24mm results is similar. In this real world scenario, 35mm is also looking great. But, I want to point out something that is slightly apparent in this comparison. Look at the flower petals slightly in front of the DOF in the lower right of each crop. One would expect these petals to sharpen as the depth of field increases with a narrower aperture. They do not. Now look at the most in-focus green leaf near the center of the image. At f/5.6, this leaf shows a significant increase in sharpness. Basically, the 16-35 L III has some focus shift, with the center of the plane of sharp focus pushing rearward as the aperture is narrowed. I'm seeing this issue most visible at the long end of the focal length and, fortunately, the subject appears to remain in focus. This issue has not caused me trouble in the field and, of course, there is no focus shift at f/2.8. Let's move to the corners. All three sets of crops shown below were captured and processed identically as the above examples with these crops showing the absolute bottom left corners of the frame (all 4 corners appear similar with the upper right being shown in the image quality tool). Images were manually focused in the corner. It was not many years ago that I would have cringed as I presented full frame extreme corner results from a wide angle zoom lens. In a relatively short period of time, state of the art wide angle zoom lens corners went from mushy/soft in appearance to the high-end-prime-grade results you are looking at here. It is rare that I do not need to show apertures narrower than f/5.6 to adequately present a lens' full capabilities, but ... vignetting is essentially cleared at f/5.6 and I didn't feel that f/8 results were needed. Impressive. At 16mm wide open at f/2.8, this lens has very strong vignetting with the corners darkened by over 4 stops, impacting the benefit that the f/2.8 aperture provides. The f/2.8 peripheral shading decreases as the focal length increases with only a relatively very mild 2 stops of darkening remaining at 35mm. At f/4, vignetting is reduced by close to 50% with corner shading ranging from 3 down to 1 stop over the focal length range. At f/5.6, the range is again reduced, now from 2 stops down to 1 stop. At f/8, the long end of the focal length range has only about .5 stops of shading remaining, but the wide end still has a bit over 1 stop of shading and that amount may be noticed in some scenes. Stopping down to f/11 results in only a minor change in this regard. 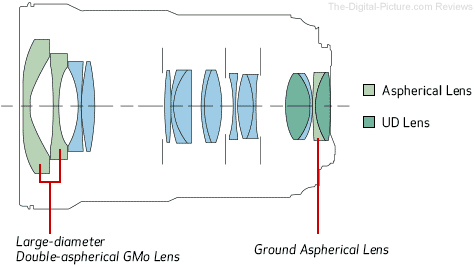 A wider aperture lens is usually advantaged over a narrower comparable lens in regards to vignetting when the same focal lengths and apertures are compared. Surprisingly, the 16-35mm f/2.8L III and 16-35mm f/4L IS have similar amounts of vignetting over the wider angle range, though the f/2.8 lens has less corner shading at the 35mm end. By f/8, the f/2.8 has a slight advantage over the range and increases that advantage slightly at f/11. The 16-35 f/2.8L III is similar to the Zeiss 15mm f/2.8 Classic Lens and the Canon EF 24mm f/1.4L II USM Lens (at f/1.4) in this regard, but among the strongest vignetting lenses available. If the all wavelengths of light in the visible spectrum refracted identically, a lens designer's job would be a lot easier. Because they do not, we get aberrations caused by various wavelengths of light being magnified and focused differently. I find the most easily recognized type of CA (Chromatic Aberration) in a lens to be lateral (or transverse) CA. Lateral CA shows as various wavelengths of light being magnified differently with the effect being increasingly noticeable toward the image circle periphery, causing the most-effected area of the image to appear less sharp due to misaligned colors. Look for the strongest latCA color fringing along edges of strongly contrasting lines running tangential (meridional, right angles to radii) near the corners of the frame, generally irrespective of the aperture used. Lateral CA is usually something I'm not too concerned about as it is generally easily software corrected (often available in-camera) by radially shifting the colors to coincide. Zoom lenses generally have latCA and latCA is generally worst at the two ends of the focal length range. On our enhanced resolution test chart, I see very little CA in the 16-35 L III results until 35mm where a very small amount is present. In the field, I can coax a small amount of latCA out of extreme 16mm corners with a 5Ds R, but 35mm latCA remains well-controlled. 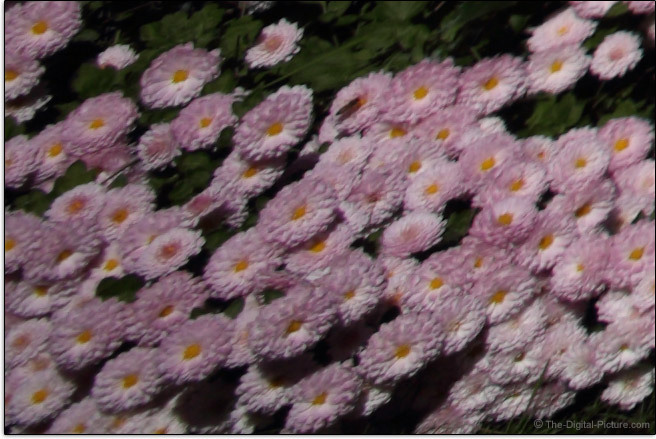 Following are three 100% crop examples taken from the top right corner of 5Ds R images. 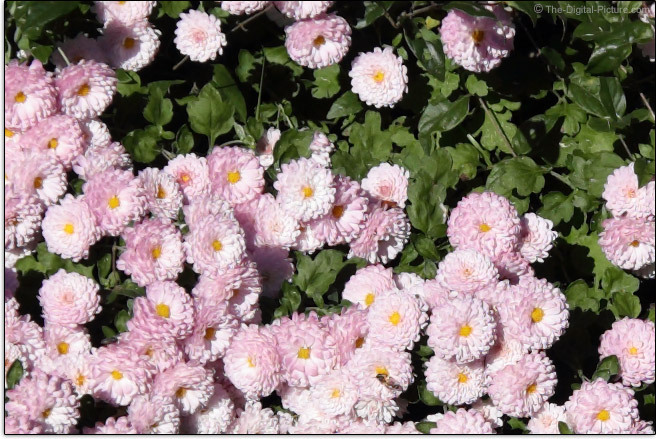 Look for the green and magenta lines of color in areas that should appear white. Axial CA and spherical aberration along with spherochromatism are common lens image quality affecting issues typically seen as color fringing/halos and haziness. This lens performs very well in these regards. 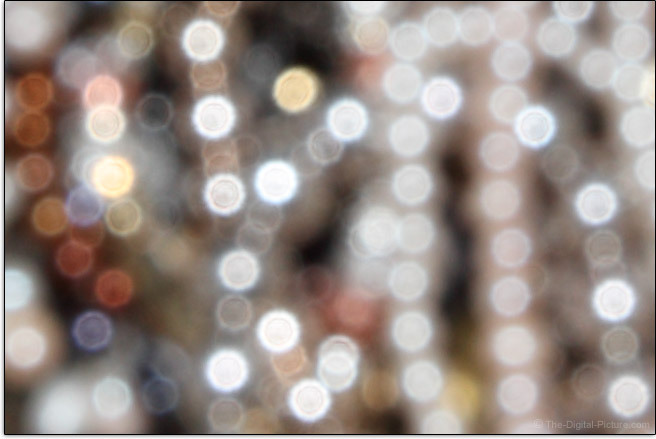 Here is an example showing out of focus details in front of and behind the plane of sharp focus. Note how the blurs retain their original color very nicely, void of fringing colors. Flare is a particularly destructive lens trait with the effects being especially hard (or nearly impossible) to remove at times. With 16 elements (including a large diameter GMO (glass molded) dual surface aspherical lens and ground aspherical lens) in 11 groups, it was easy to predict that the 16-35 L III lens will not be completely flare free. 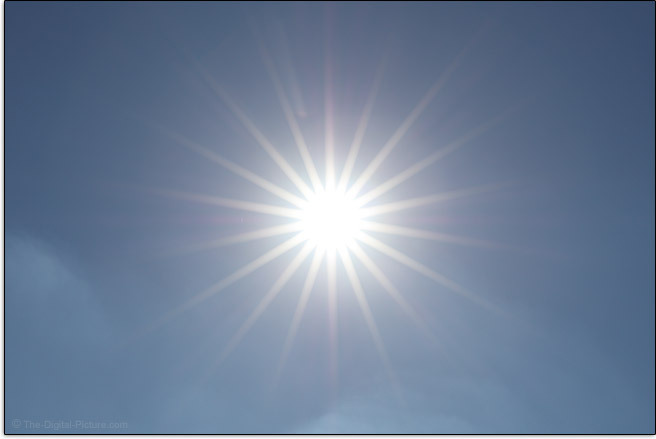 However, this lens avoids flare very well at its widest apertures, even with the sun in the corner of the frame. Narrow apertures typically show a stronger amount of flaring and that is again the case with this lens. But, even at f/16, only relatively mild flare effects are present. This strong performance is, at least in part, due to the SWC and ASC coatings (more below) utilized on this lens. Coma is generally recognized by sharp detail contrast towards the center of an image and long, soft contrast transition toward the image periphery. Coma is most visible in wide aperture corners and significantly resolves when the lens is stopped down. The pin-point stars in the night sky are the subject that brings this aberration (and some other aberrations) out most easily for me. Following are examples captured at both focal length extents and 24mm. These are f/2.8 top right corner 100% crops captured with a 5Ds R (without tracking). Astro photographers are always looking for a better star lens and many of us were anxious to see how this lens performed on this subject. The good news is that this appears to be one of the best lenses yet for this subject. 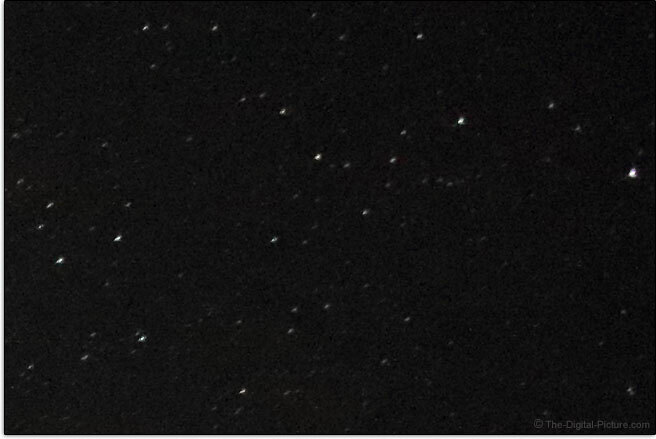 The stars are not perfectly round at 16mm, but they are very well-formed relative to the other options available and the more-centered stars are very sharp. At 24mm, I see faint wings starting to take shape and the brightest stars appear to have wings at 35mm where this lens performs more average. Geometric distortion makes framing a scene with a straight horizon, such as the ocean, challenging as no lines in the scene remain parallel to the frame edges of the viewfinder or viewfinder gridlines. Cameras with electronic levels have a big advantage in overcoming this issue. When your lines need to remain straight and the destructive correction process is to be avoided, simply select a focal length that has little or no distortion. Wide angle lenses are not renown for their ability to create strong background blurs (though the wide f/2.8 aperture is helpful in that regard) and the importance of the bokeh, referring to the quality of the background blur, of such lenses becomes reduced. I'm not seeing anything out of the ordinary from the 16-35mm f/2.8L III's performance in this regard. Real world blurred backgrounds appear nice. Here are a trio of f/8 out of focus specular highlight samples. Nothing amazing here. 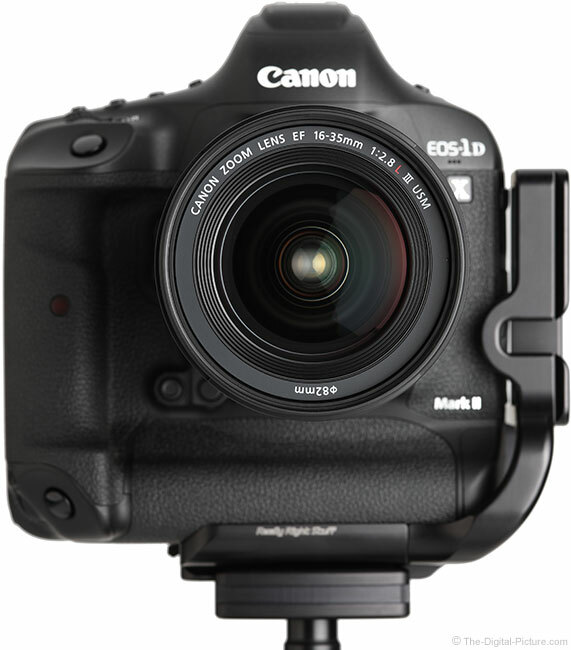 The 16-35 L III gets 2 additional aperture blades over the II, increasing the count from 7 to 9. More blades mean the opening can be kept rounder at narrow apertures (results seen above). An odd number of blades means that we get twice the number of points on bokeh stars (18 in this case) created from bright lights captured at narrow apertures. Are 18 points better than 14 points created by the II? That answer is not black and white and personal preference comes into play here. My take is that more are better. Also notable is that f/2.8 lenses generally create a stronger star effect than f/4 lenses when used at the same narrow aperture. The following reduced and slightly cropped examples were captured at 35mm f/16 using the referenced lens. Even though a wide aperture lens is not needed for a specific photograph, I will often choose a wide aperture lens to get the stronger star effect they often create. A cityscape captured during the blue hour or at night is a more-specific example of when I prefer to use an f/2.8 zoom over an f/4 zoom. Having stronger star effects created by the street lights and other lights of the city can give an image an extra pop. Here is an example captured by this lens' 24-70mm equivalent. At its announcement, Canon USA's Rudy Winston stated that this lens is "really something special". He was right. 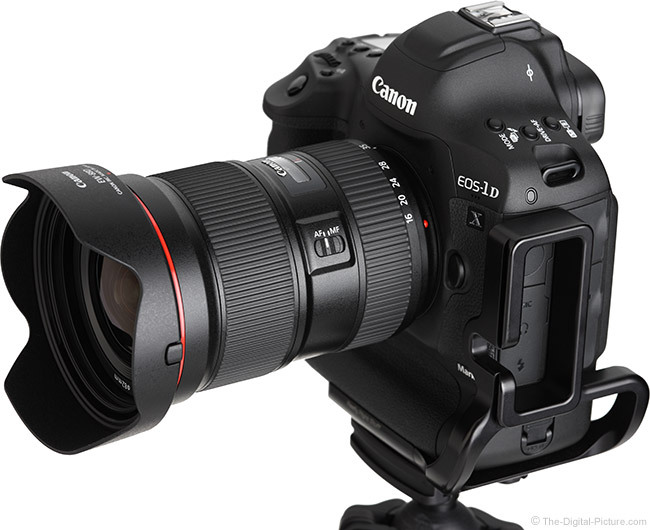 Overall, the Canon EF 16-35mm f/2.8L III USM Lens very strongly impresses with its image quality. I don't usually spend much time talking about lens elements and coatings, preferring to let those features of a lens speak through the image quality. The results are what really matter. But, what Canon has put into this lens is worth noting. 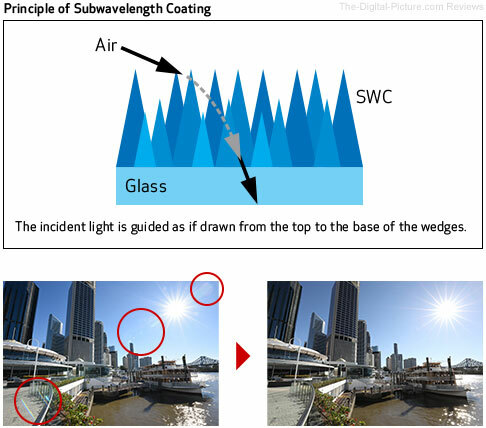 Three kinds of special lens coatings have been used on the 16-35 L III: Subwavelength Coating (SWC), Air Sphere Coating (ASC) and Fluorine. 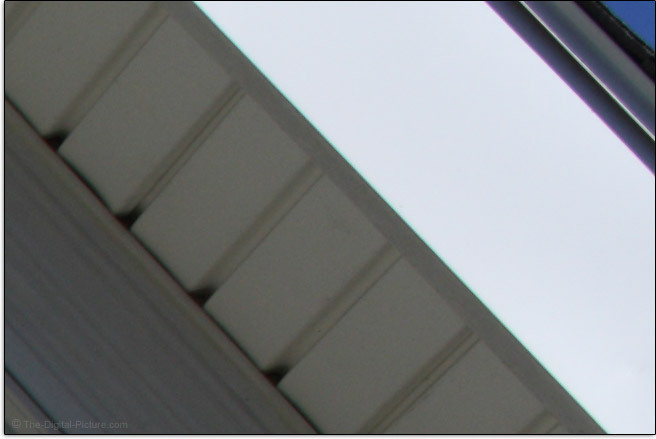 Reducing flare and ghosting is the primary goal of these coatings and increased contrast is the end result. The third coating, Fluorine, is applied to the front and rear lens surfaces. Fluorine's non-stick properties prevent dust and water drop adhesion and makes lens cleaning much easier. 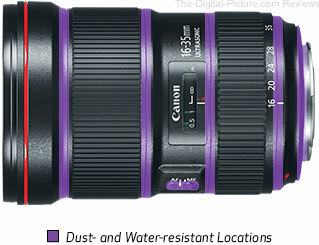 Fingerprints, for example, easily wipe off of lenses with this coating (many of Canon's better lenses now have this). 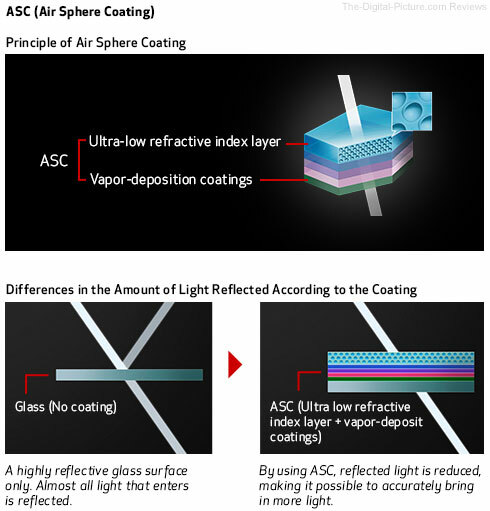 This coating is especially valuable on a lens this wide as dirt on the front lens element can appear in images. The special lens coatings and elements certainly contribute to the image quality delivered by this lens. For a great deal of the photography being done today, AF is relied upon and a great autofocusing system is the key to a lens reaching its image quality potential. 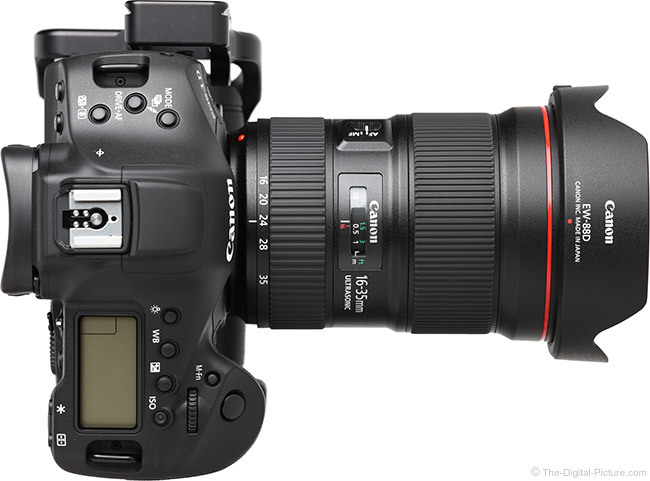 Canon's Ring USM (Ultrasonic Motor) driven AF systems have long set the standard for DSLR lens autofocus performance and this system is once again found in the Canon EF 16-35mm f/2.8L III USM Lens. The 16-35 L III focuses very fast with only light clicks and shuffling being heard in the lens (if in a quiet environment) and bystanders will not likely hear anything. AF accuracy cannot be tested in every scenario possible, but ... too often this testing takes on a very time consuming life of its own. But, this is nearly always with a third party lens. On the EOS-1D X Mark II, the 16-35 f/2.8L III's focus accuracy performance has been nearly flawless. Both copies of this lens focus very accurately with the 5Ds R in the lab. But, for some reason, both lenses gave me a modestly reduced AF hit rate on two other 5Ds R bodies. Although focusing was inconsistent, AF Microadjustment (to the front) made one of the two lenses focus very well with only infrequent misses. Strangely, I have not yet been able to completely dial in the other camera yet. Results from the 7D II were not as consistent as from the 1D X II. This lens focuses internally and FTM (Full Time Manual) focusing is supported. At the wide end of the focal length range, subjects change size a modest amount during full extent focus distance changes. While this attribute is not unusual, some photographers need to be aware of it. Those intending to use focus stacking techniques involving focus distance adjustment will want to know. Videographers are sometimes concerned about this attribute. Those very-critically framing a scene need to fine-tune focus while adjusting the focal length and/or subject distance. The amount of subject size change diminishes to very little at the 35mm end where this lens performs above average. Seldom are non-cinema lenses parfocal and the two copies of the 16-35 L III I checked are not close to being so. You should refocus after changing the focal length. The 16-35 L III's manual focus ring is nicely sized and positioned toward the front of the lens (where I like it). Canon's latest L lenses (especially) have had smooth, well-damped focus rings with no play and a rotation amount that provides a good balance between precision focusing and focus acquisition/tracking speed. This one is no different, except that one of the two copies I have has a very slight amount of play in the MF ring. Like all of the other lenses in its class, the current focus distance setting is available at a glance via a focus distance scale provided (in a window). 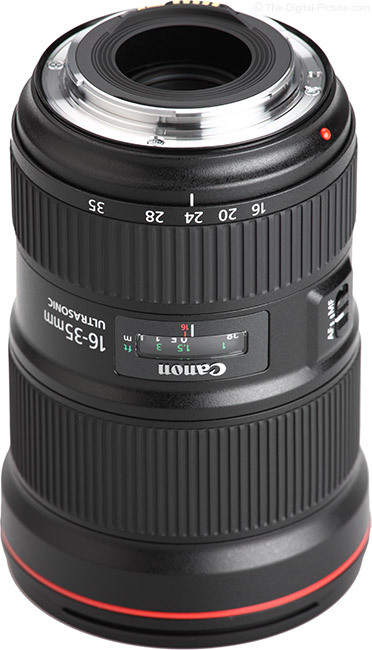 The 16-35 L III has a MFD (Minimum Focus Distance) of 11" (280mm) for a class-leading 0.25x MM (Maximum Magnification) at 35mm. While this is a class-leading spec, it is not so by a differentiating amount. The 0.25x works nicely for flower photography and relatively small products can be tightly framed. To reduce the MFD and thereby increase the MM (dramatically in this case), mount an extension tube behind this lens. Infinity and even medium distance focusing are sacrificed with an ET in use, but the change in magnification is very significant. With a Canon EF 12mm Extension Tube II in the optical path, Canon specifies this lens having a magnification range of 0.65x. I know that is not really a range, but ... it is an attractively-large number. 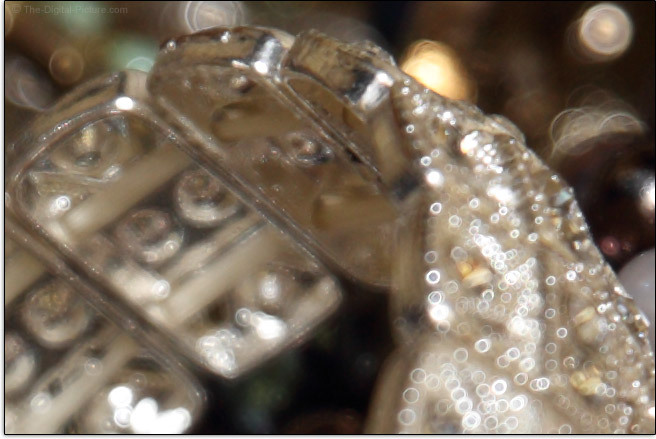 A Canon EF 25mm Extension Tube II takes the magnification "range" spec to a crazy high 1.14x. Note that Canon specifies that ETs are not compatible at the widest focal lengths and the "Will the 1.14x be magnification range be usable?" question was the first to enter my mind. With the 12mm ET in place, a working distance of about 3.5" (89mm) is available at 35mm with a short range of focus distance available. While I didn't scrutinize corner image quality, center of the frame image quality was quite good even at f/2.8 and the working distance, though short, is usable. That there is only about 1.5" (38mm) of working distance (without the hood installed) with the 25mm ET in place means that simply lighting the subject is very challenging. Few are likely to find use for this combination. A usually-reliable theory dictates that the higher the version number, the better the lens is and this is the first L lens to receive a "III" designation for its version number. Canon's Canon L Series lenses are great and I always look forward to getting a new one. These lenses are built to a higher standard than the average lens and all are ready for professional use. 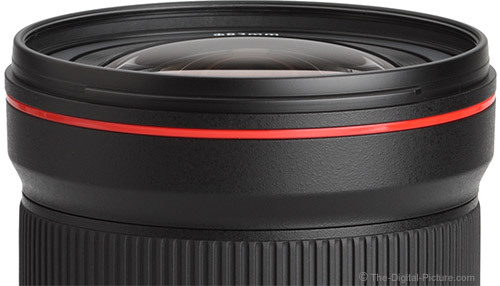 Canon indicates that this lens has received enhanced mechanical durability. While the two lenses are similar in their basic designs, the III appears modestly modernized from the II. 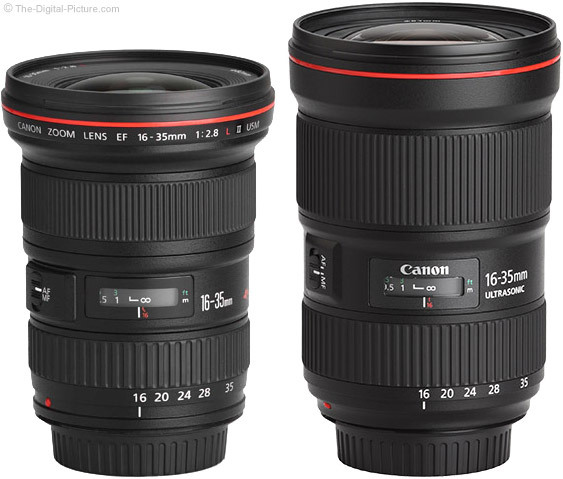 The Canon EF 16-35mm f/2.8L III USM Lens looks very similar to many of its current siblings (such as the EF 24-70mm f/2.8L II Lens shown below right), sharing many design cues. The textured deep black finish looks sharp and has proven very durable in recently introduced lenses. Zoom and focus rings are nicely integrated into the lens body with only a thin seam showing at the edges. The comfortable-to-hold, smooth, nearly-straight overall design includes a flush-mount switch (there is only one) that doesn't dig into fingers during use. The rear-positioned zoom ring (my strong preference), appearing very similar to some other recent L lenses, is very smooth with a good rotation rate and proper dampening. As illustrated below, this lens extends and retracts with focal length change (like its predecessor). But, the extension stays within the bounds of the lens barrel, making this movement seldom noticed and gravity-driven extension is not an issue. As usual for a Canon L lens, the 16-35mm f/2.8L III is weather sealed. I prefer to use a protective rain cover when I know that my gear will be subjected to dirt, dust or moisture, but ... sometimes these detriments are not expected and weather sealing can become very important in those instances. Note that a filter is required to complete the sealing around the front lens elements. A trend we are currently seeing is new lens models being slightly larger and weighing slightly more than their predecessors. While most would not find these to be positive changes, the benefits driving the size increase, including better build quality and better optical designs, have been substantial. Few of us are going to find the III's size and weight growth to be substantial. A lens of this size and weight is a joy to use, is not a problem for most to carry for long periods of time and takes up only a modest amount of space when stored. 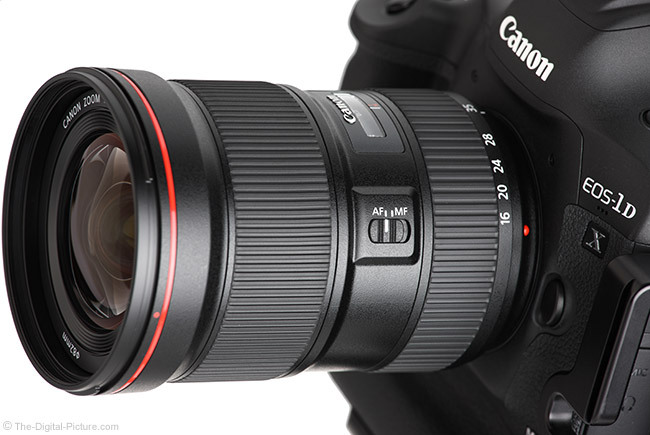 For many more comparisons, review the complete Canon EF 16-35mm f/2.8L III USM Lens Specifications using the site's Lens Spec tool (comparison of potential interest preloaded). Interesting is that the 16-35 f/2.8 L III is slightly longer than the 24-70 f/2.8L II and only slightly lighter. Here is a visual comparison of 4 Canon ultra-wide angle L-Series zoom lenses. Use the site's product image comparison tool to visually compare the Canon EF 16-35mm f/2.8L III USM Lens to other lenses. 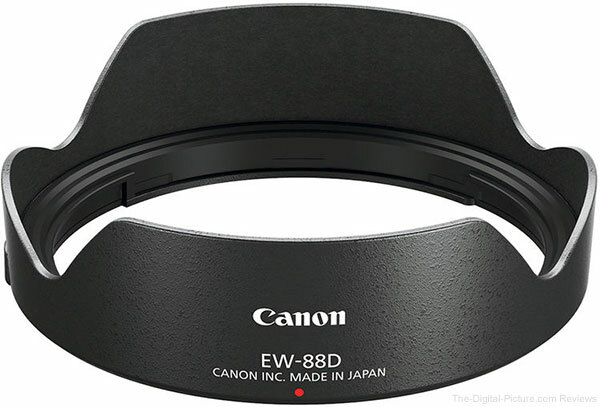 For their L-Series lenses, Canon always includes the hood in the box and the petal-shaped Canon EW-88D Lens Hood is the model that comes in this box. As seen in the side-by-side comparison above, the version II lens hood (similar to the 17-40 L lens hood) has a very wide design that doesn't fit nicely into a case, backpack, etc. For that reason, I seldom used it (and I always use lens hoods). The 16-35 f/4L IS showed up with a very nice, more-compact hood design and it is great to see the III receiving a similarly designed, more-compact model. This hood has a flocked interior for essentially complete elimination of reflections and the hood effortlessly installs with a push-button lock holding it in place. 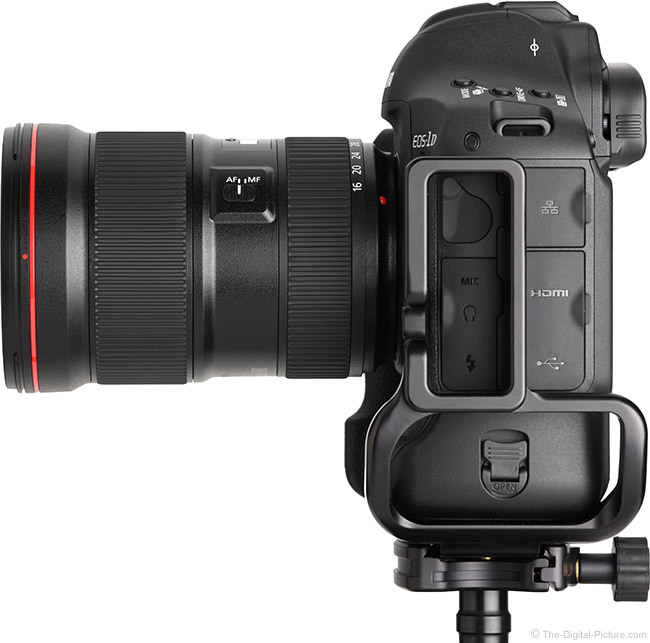 Like its predecessor, the 16-35 III receives 82mm filter threads. Though these filters are large and relatively expensive, an increasing number of lenses are using this size – and those building a Canon f/2.8 zoom lens kit will appreciate the 24-70 L II sharing this size. A standard thickness circular polarizer filter used on this lens will increase light falloff in frame corners very slightly. Although this is a relatively minor issue, I recommend purchasing a slim model such as the B+W XS-Pro filters to avoid it completely. Note that using a circular polarizer filter at wide angles can result in an uneven effect in some scenes, but I find these filters to be invaluable in this focal length range. 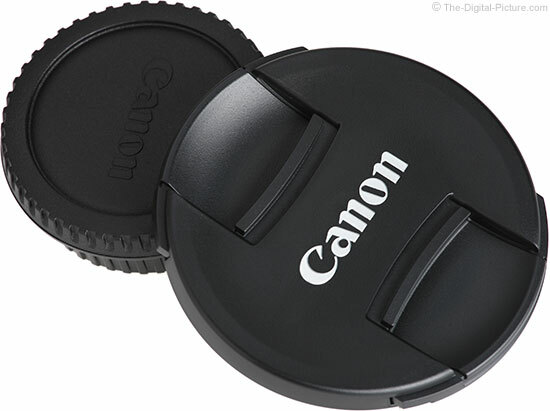 The 16-35 L III, like the other lenses in its class, ships with a Canon drawstring lens pouch. 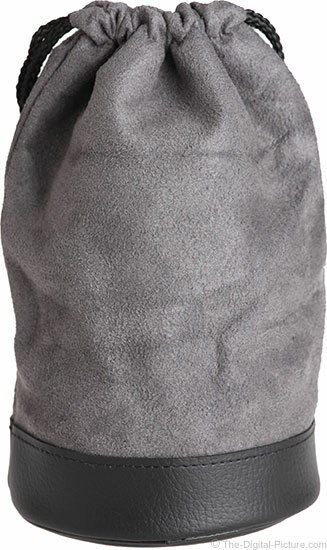 These pouches offer some minimal padding on the bottom, but primarily protect from dust and scratches (vs. impact). Check out Lowepro's Lens Cases for affordable single lens protection during storage, transport and carry. Canon's f/2.8 L lenses have a high price tag and this one is no different. The f/2.8 lenses enjoy a 2x wider aperture than their f/4 counterparts and their prices are correspondingly (roughly) 2x higher. Those who know that they need an f/2.8 max aperture will find this lens worth the price, but for those who can live with f/4 (many can at wide angles), the price will be a substantial differentiator. 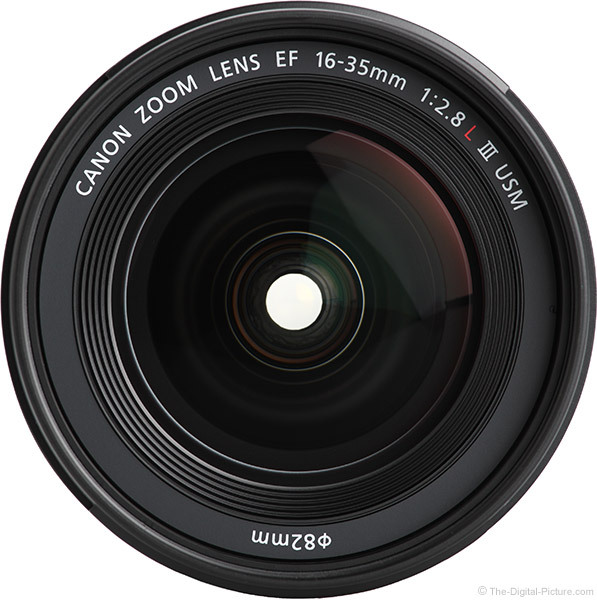 As an "EF" lens, the Canon EF 16-35mm f/2.8L IS III USM Lens is compatible with all Canon "EOS" cameras (the EOS "M" line requires an adapter). The reviewed lenses were online/retail-sourced. 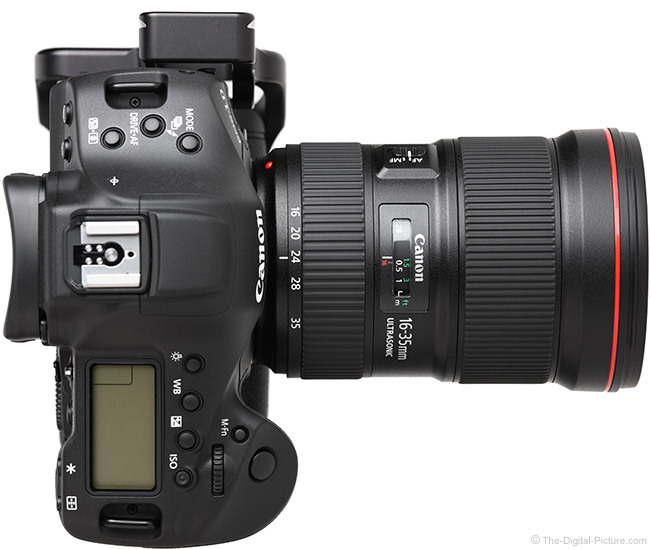 If the 16-35 L III had IS, I expect that it would clearly rule over all of the competition. It does not and that leaves the door open. 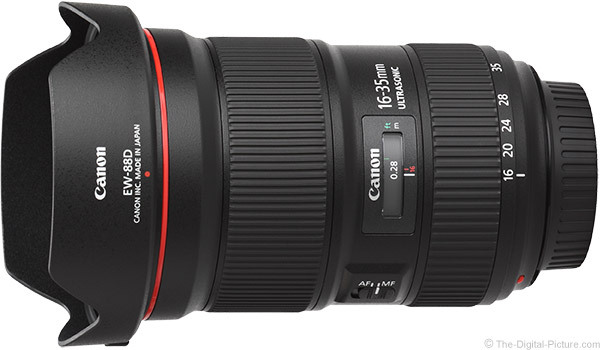 Between the large price differential and the versatility of its IS feature, the Canon EF 16-35mm f/4L IS USM Lens is the lens I see competing most strongly against the 16-35 III. The f/4L IS lens performs excellently and it was hard to imagine the 16-35 III besting it substantially in any way. While I wouldn't call the difference "substantial", as mentioned earlier in the review, the III indeed delivers better image quality at f/2.8 than the f/4L IS does at f/4 and that is very impressive. Stop down and I don't see image quality factoring into the decision process. In addition to costing roughly 2x more, an equivalent focal length range f/2.8 lens has a larger size and heavier weight than an f/4 lens. In this case, the f/2.8 III is 6 oz (175g) heavier and measures 3.5 x 5.0" vs. 3.3 x 4.4". As already stated, the aperture difference between f/2.8 and f/4 is 2x and, to many, that is a much bigger deal than the size and weight difference. An f/2.8 lens can stop action in 1/2 as much light and can more-strongly blur the background than an f/4 lens. The f/2.8 has other benefits including less vignetting at some equivalent focal lengths and apertures. It also creates a better star effect. As a generalization, sports photographers, event photographers and similar will want the f/2.8L III. Landscape photographers will more frequently prefer the f/4L IS for most of their needs, but ... they too may want the f/2.8L III in their kits for cityscapes and astrophotography purposes. 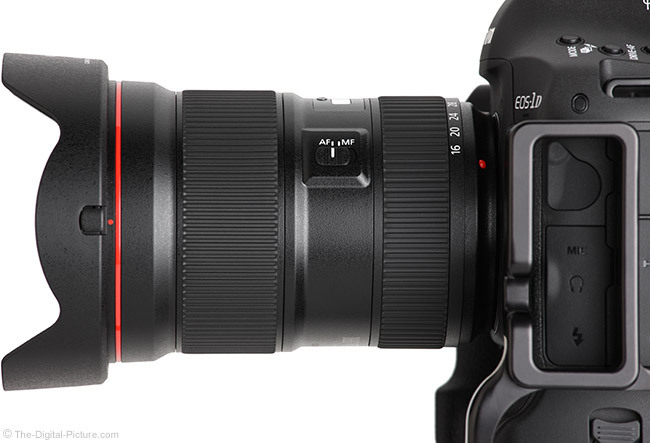 An even more recent addition (than the f/4L IS) to Canon's lineup is the Canon EF 11-24mm f/4L USM Lens. While this lens does not cover the longer end of the 16-35mm FLR, it has a crazy wide angle 11mm on the other end. The 11-24 is as impressive optically as it is physically, though its max aperture is, again, f/4. In this case, the f/4 lens is considerably more expensive and modestly larger and heavier. The 11-24 puts up a good fight in the image quality comparison, but I'd say that the 16-35 L III takes it even at f/2.8 at the same focal lengths. An issue for some is that the 11-24 does not accept threaded front filters. I find the 11-24 to be complementary to one or both of the 16-35 lenses. If you can only have one, their differences must be weighed. 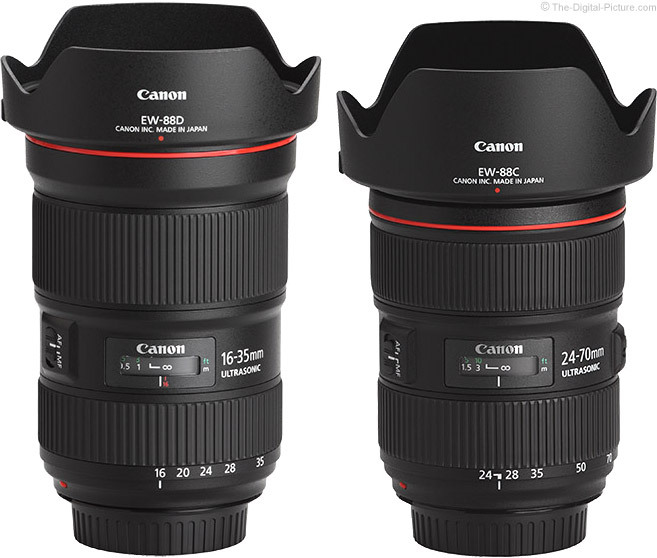 As discussed previously, the Canon EF 16-35mm f/2.8L II USM Lens is slightly smaller and lighter than the III. It also costs less and shows less peripheral shading at 16mm f/2.8. But, the new 16-35 III is a very substantial upgrade, especially optically, and I think that, to a serious photographer, the III is easily worth the noticeably higher price over the II. Where does the Sigma 24-35mm f/2 DG HSM Art Lens fit in? The Art lens has (very roughly) half the focal length range, twice the aperture opening and half of the cost. All three of these points matter. From an image quality perspective, these two lenses are similar at the same focal lengths and apertures. The Sigma is slightly heavier, but these two lenses are similar in size and share the same filter size and MFD. My preference is for Canon's AF system. Tamron's latest entry in this lens class, the 15-30mm f/2.8 Di VC USD Lens, shifts the focal length range slightly wider at both ends. The Tamron costs more than the Sigma 24-35 f/2 Art Lens, but is still considerably less expensive than the Canon 16-35 L III. From an image quality standpoint (use your visualization skills to discern between the differing camera resolutions), the Canon is my strong preference, especially at the wide end. Not to be overlooked is that the Tamron has BOTH the f/2.8 max aperture and VC (Vibration Control). A drawback is that the Tamron 15-30 VC does not have front filter threads and again, my preference is again for the Canon AF system. I have long regarded the Zeiss 15mm f/2.8 Classic Lens as one of the best ultra-wide angle lenses available and I have had this lens in my kit for years to cover my night sky and other ultra-wide f/2.8 needs. The Canon 16-35 L III vs. Zeiss 15 comparison illuminates just how great the 16-35 L III is. The zoom is not as wide as the prime and has slightly more distortion 16mm, but the zoom features many advantages including autofocus, a much higher maximum magnification and a range of focal lengths at approximately the same size and weight with a slightly lower cost. Another great wide angle prime lens is the Canon TS-E 17mm f/4L Tilt-Shift Lens. We have not yet tested the TSE 17 on the 5Ds R, but in a differing-camera comparison, I see the 16-35 III being the modestly better performer at wide open apertures. With its very wide objective lens, the TS-E 17 has less shading in deep full frame corners and has less distortion. The prime has the tilt-shift feature, but lacks the f/2.8 aperture, front filter threads, autofocus and a zoom range (of course). It also has a considerably lower maximum magnification. The price of these lenses are roughly equal as are their weights. The zoom is modestly shorter. 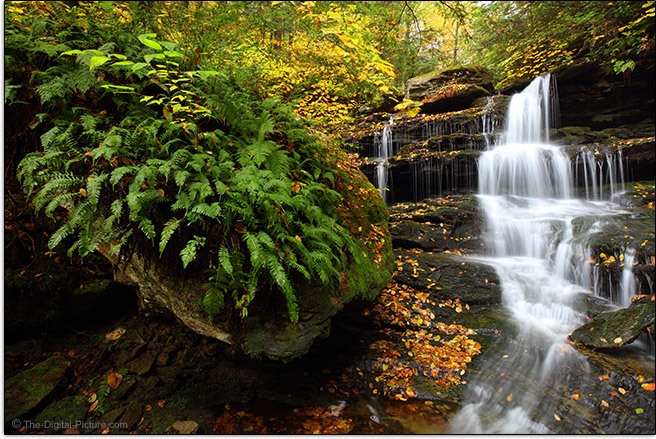 There are many more 16-35mm f/2.8L III comparisons that can be made. Use the site's lens comparison tools to create your own comparisons. This is a lens that may replace a prime lens in your kit (raises hand). Or, perhaps several of them. Immediately after becoming available, the 16-35mm f/4L IS lens took on such an important role in my kit that I've been contemplating the purchase of a second copy of it ever since. I've felt exposed by not having a direct backup for this lens during important shoots and photo trips. When the 16-35mm f/2.8L III was announced, I immediately suspected that the second ultra-wide angle zoom lens my kit needed was going to be available. My suspicion was realized. A 16-35mm lens is an essential part of a basic full frame DSLR camera kit and the Canon EF 16-35mm f/2.8L III USM Lens is arguably the best ever (though I wish it focused more reliably on one of my 5Ds R bodies). The 16-35 L III is the new standard wide angle zoom lens for professional and serious amateur wedding and event photographers, photojournalists, sports photographers, street photographers and many others. The next time you are looking at your low light event photos and wishing that the results were sharper, remember this lens – it may have your name on it. If image stabilization is not needed, this is the ideal lens for landscapes and the rest of the ultra-wide angle needs covered by 16-35mm.